28th December: Rugby for the coming weekend: 2nd January 2016. Second XV entertain Llanishen II on the Harlequins. The game of the day for the Rocks will be the Youth v Cowbridge on the Arms Park – 12 Noon Kick off. Happy New Year. Karaoke / Disco from 19.00. Feel free to bring your own nibbles, snacks and turkey sandwiches. 6th December: For the second time this season, The Rocks and Dinas share the spoils. Having drawn 12 a-piece at the beginning of the season, yesterday ended 5 all away at Dinas. The seconds were less fortunate going down 5-54 to the Squirrels. 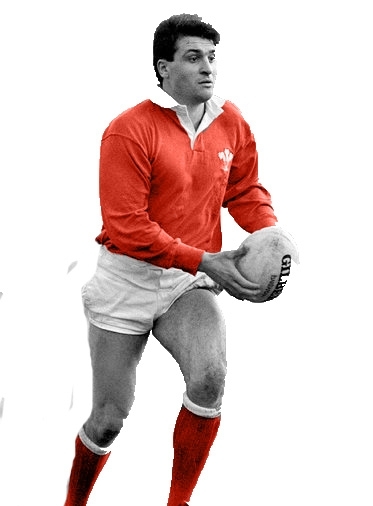 3rd December: Peter O’Brien’s funeral will take place on Thursday 10th December, 1:30pm, at Christ the King Church, Cardiff; 3.30pm at the crematorium and later at Llanishen Rugby Club. All are welcome to attend and celebrate Peter’s life. 3rd December: Three games on this weekend. First XV away to Dinas Powys. Second XV at home to Rhiwbina and the Youth to face Llanishen. Good luck to all. 1st December: Wales v Scotland Hospitality at St. Peter’s Rugby Club: 13th February 2016- Details here. 30th November: It’s three out of three to the Two Gang. 29th November: After the washout of yesterday, where no fixtures were played, here’s hoping that the storms will ease up for next weekend’s fixtures. The First XV travel to Dinas Powys, Second XV will be at home to Rhiwbina II and the Cavaliers are also at home to Sully Sports II. Umbrellas permitting. 25th November: Rugby this weekend: The First XV are away to Pontyclun, Second XV are also away – to Dinas Powys, Third XV at home to Canton – please contact Andrew Chandler with your availability. 14th November: Good win for the Rocks away at Gwernyfed in the rain. Gwernyfed 10-19 Rocks. Seconds game was cancelled. Club Social Evening 21st November Next Week – Three Home Games – Let’s all stay on for an hour or six. Could be a quiet one!!! 6th November: First XV v Penarth is off due to waterlogged pitch. Second XV game is still on. 5th November: Rocks Rugby this weekend. First XV at home to Penarth. This is a second v third place game and well worth a visit to the Harlequins on Saturday afternoon. Second XV will be travelling across the city to Cardiff Quinns. Meet at 12.15 at the club. If you are going straight there contact Chadler on 07725952594. As you can all see the second team pitch now has a thick growth of grass on the surface. For the pitch to stay safe this surface will have to be maintained. To ensure this the following plan is to be implemented. Only selected matches are to be played on the pitch. Only youth and senior matches are to be played on the pitch. Juniors not to use the pitch. 24th October: Disappointing result for the First XV away to Llantrisant today, 24-19. The seconds (under the tutelage of Andrew ‘make sure you mention my 100 percent record’ Chandler) were victorious over Rumney 22-19. It’s cup week at the Rocks. First XV v Clwb Rybgi Caerdydd in the SWALEC Bowl Cup Competition – . 10th October: Good win for the First XV, today on the Harlequins, scoring 5 tries against Abercynon to win 33-26. Tries by David Mitchell, Amir Jiwa Walji, Rhys Andrews (2) and Luke O’Brien. The rest of the points went to the boot of Alex Jones, moving us into second place behind Porth Harlequins. The seconds lost away narrowly to neighbours Rhiwbina 15-14 in the Mallett Cup. The youth beat Llantwit Fardre 8-21. 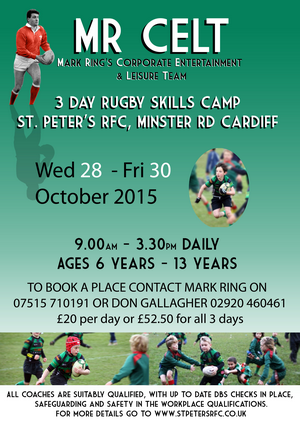 5th October: Rugby this weekend. First XV have a 1.00pm kick off against Abercynon at home. Seconds have a 1.00pm Mallet Cup Kick off at Caedelyn Park against Rhiwbina II. 4th October: Two good wins for the Rocks yesterday and one great win for Wales yesterday. The First XV had a narrow win over Dowlais on the Harlequins 30-28 and the thirds travelled to Pentyrch to bring home a win 5-17. Glamorgan Wanderers II cancelled on their fixture with us. Australia beat England 33-13 and knocked them out of the World Cup 2015. Bless. 29th September: It’s true! 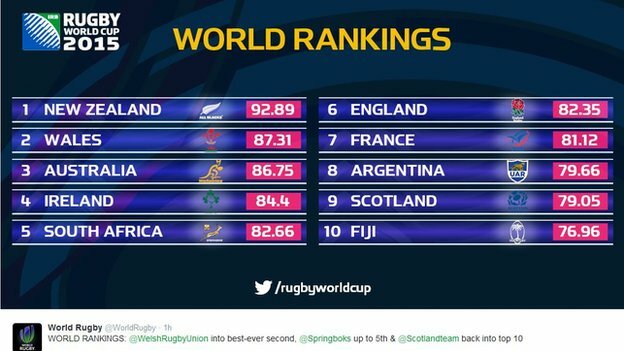 Wales AND Ireland are ahead of France, but beware – Fiji are in the Top Ten. 27th September: On one of the hottest September days in many years, the First XV travelled to, newly promoted, Treherbert, at the head of the Rhondda Fawr valley and were welcomed with a sign on the stand stating ‘Welcome to Hell’. 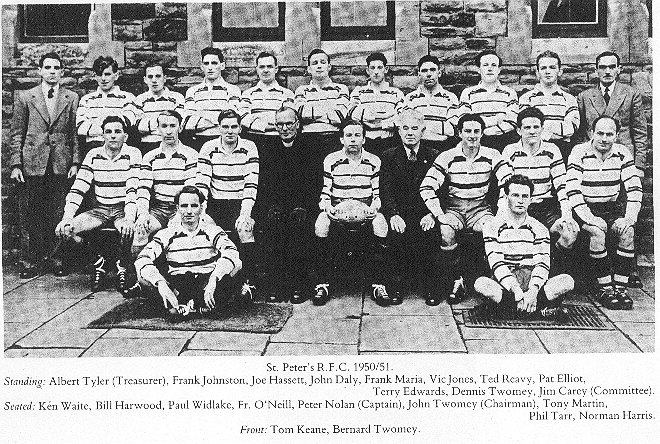 Unfortunatley for the home team, St. Peter and the team opened the gates of heaven and extinguished the burning home fires with a six try, running spectacle, to head home with a 10-39 win. Tries by James Morris, David Mitchell and a brace for Luke O’Brien and Benon Kizza (is that a pair of braces?) ran the ball at pace splitting the home defence three times before half time. Kizza running in the best of the six with a 40 yard, side-stepping, sprint to the line. Treherbert crossed for consolation in the dying embers of the game. And Wales beat England 25-28 :). 20th September – Mixed results yesterday for the Rocks yesterday. Firsts lost 29-38 to Porth Harlequins in the League whilst the Seconds beat St. Joseph’s Seconds 28-17 in the East District Cup. 17th September: Arrangements for this weekend as we have four games scheduled at home. Thank you to Old Pens for agreeing to switch the fixture. Senior 1st Team, Home on first team pitch. Youth 1st Team, Home on Second team pitch. Senior 2nd Team, Home but playing at Cardiff Uni pitches in Llanrumney. Youth 2nd Team, Away at Penarth playing at Old Pens ground. 14th September: Rugby this coming weekend. First XV at home to Porth Harlequins. 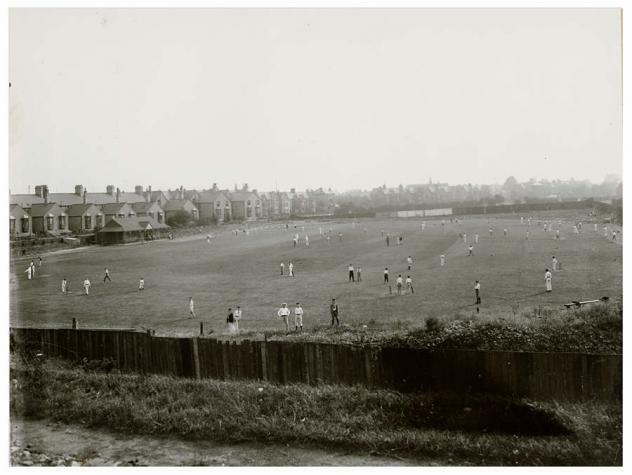 Seconds at home to St. Joseph’s II in the East District Cup – this will be played at the University Playing Fields, Ball Rd. No game for the thirds yet. 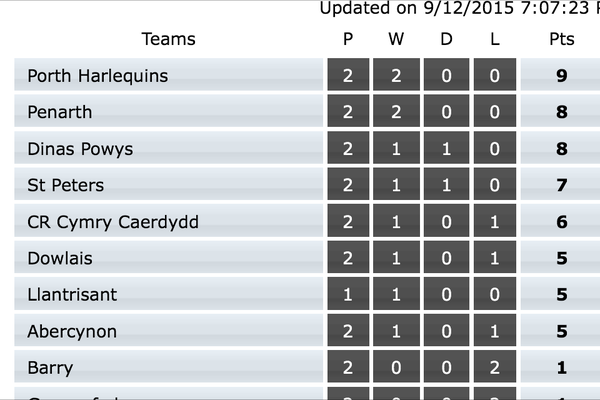 13th September: Good win for the First XV yesterday away to Clwb Rygbi on Pontcanna field. The Rocks came away with a 26-19 bonus point win. The seconds had a good day out with a 51-0 win over Barry II. The Third team game was abandoned after half an hour at 12-12. Youth also had a good win 0-23 over Chepstow. Please note due to the fact we only have two pitches, we have booked‎ the University Fields for some dates this season. You will be advised whether your match will be played at this venue the week of the game. 5th September: It’s a draw and a win for the seniors today. The First XV drew with, newly promoted, Dinas Powis 30-30 whilst the Second XV beat CRCC 24-12 away at Llandaff Fields. 4th September: The first XV are looking for a regular touch judge who is able to ‘run the line’ at all the home games (and away if possible) for this coming season. 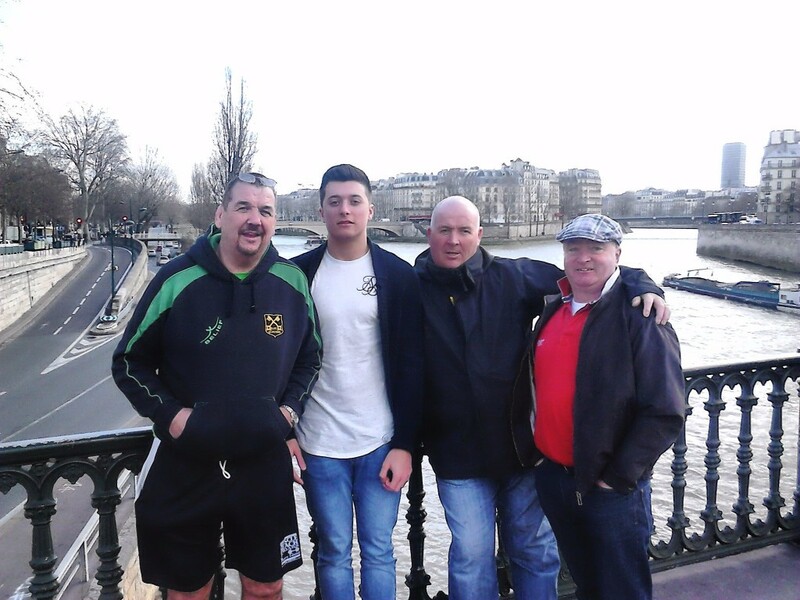 If you feel that you are able to help out – please bring your boots and see Rhodri (Team Manager). Alternatively email here. 4th September: Rocks team to play against Dinas Powis – JOSH BURRIDGE, RYAN COLE, ED DOBBS, GEORGE COOK, KRIS BARRY (C), ARTURS KOZELS, RYAN FARRAH, DAVE MITCHELL // LUKE O’BRIEN, JAMES MORRIS, LUKE THOMAS, STUART GRIFFITHS, BARNIE MOUL, PHILIP PARIYO, ED POYNTER, Subs. AARON CHIPLIN, SIMON GRISMON, JAMES DUNNE, LEWIS DAWES, MICHAEL BUTLER. The funeral of Gwylim will be on the 1st of September at Thornhill Crematorium. Wenault chapel 11am. 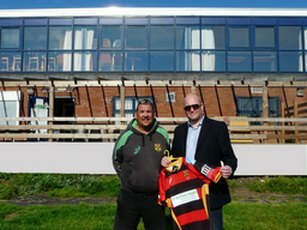 And afterward at St. Peter’s RFC. 30th August: Pre-Season match reports from Mark Here. 28th August: Message from Rodri… as well as the Firsts playing Mountain Ash at home this weekend. We also have a second home fixture against Caerau Ely that’s designed to be a run out for the 2nds and 3rds ahead of their league games. Both are 12pm kick offs so we can watch the Wales game afterwards. All players welcome, please let Mark, Gerald, Andrew or Conky know if you are available. Come for a drink if nothing else ! 22nd August: The full range of fixtures is now available for the seniors HERE. 22nd August: Youth at home today. Seniors Away to Dunvant. 20th August: Many thanks to more of our shirt sponsors: Rocks will be sporting a home kit and an away kit this season. The away kit will be that of the, now defunct, St. David’s RFC of Cardiff, who used to play their home games on the third pitch, or the right hand pitch, at Blackweir. Hi. For those of you that didn’t know. Gwilym khan. 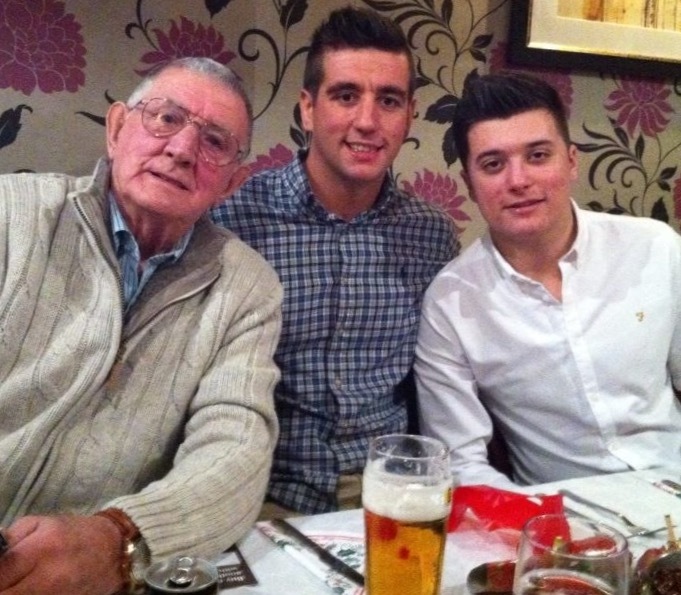 (Matthews grandad. And ringos father in law) passed away a couple of days ago. Just In case you would like to know, the funeral of gwylim will be on the 1st of September at Thornhill Crem. Wenault Chapel 11am. And afterward at St. Peter’s RFC. Youth Warm up games: Penygraig at home 22nd and Gilfach Goch away on the 29th August. Senior Warm up games: Dunvant Away 22nd and then Mountain Ash home 29th. 6th August: AGM is now on 5th September 12 noon. 4th August: Many thanks to Sarah Hussain, from Nuffield Health, who presented Mark Ring (Head Coach) with our new kit for the coming season. 28th July: There is clearly a lot of dissatisfaction around the city at the moment with the introduction of the new waste collection service refuse containers. It’s an emotive subject which affects every household and is extremely upsetting to many many people who care about our city and how it presents itself to the world. 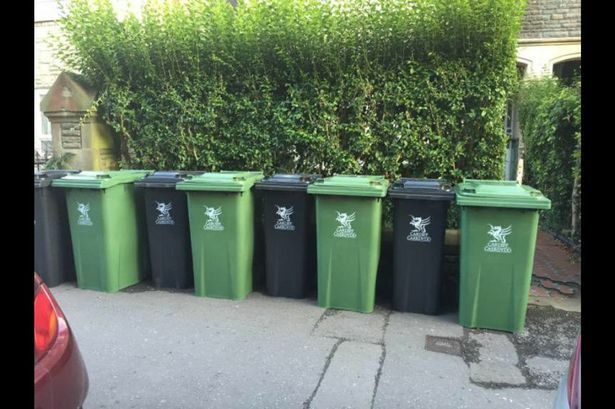 For a large proportion of Cardiff’s population it’s simply an unnecessary inconvenience and a restriction on what and where and when we can dispose of our household waste – but don’t you just love the choice of colours!!! 21st July: Frank Johnson’s funeral will be Friday 24th July at 10.45 at St. Cadoc’s Church, Parracombe Crescent, Llanrumney. I’d like to bring to your attention that Frank Johnson (my father in law) passed away early this morning, aged 90. He played for the Rocks for many years into his forties, and captained the 1st team sometime during the late 50s and 60s. He was fondly known as blind side as although playing mostly at hooked, he’d lost an eye during an industrial accident. I’m sure some of the older members will remember him fondly, and I’d be grateful if you bring this to their attention on the notice board. The details of his funeral will be put in the ‘Echo’ next week. 9th July: Many thanks to Frank Sullivan for providing the information. Back Row: Mike (Radar) Payne, John Evans, Sid Judd, Terry Coughlin, Frank Jones, Mike Morgan, Paul Barry, Bernard Fowler, Tony Barry, Arthur Thomas, Tony Phippin, Mike Coughlin, Lawrence Camilleri. Front Row: Terry Johnston, Mike Thomas, Andy Laver, Lexi McCormac, Frank Sullivan, Joe Crocker, Chris Corsi. 4th July: Preseason Training starts Tuesday 7th July at 6pm start. Training will then be on Tuesdays and Thursdays 6pm, Saturdays 9.30am etc. Harlequins Playing Field. Contact Mark Ring for more details: 07515710191. Youth Training: Thursdays – 18.30. 26th June: After nearly six weeks of being down the site is nearly back…nearly. There will continue to be missing pictures and files here and there, but it will get sorted eventually… eventually. 22nd June: MRCELT Announces Summer Rugby Camp dates. CAMP 3: 26-28 August 2015. £20.00 per day or £52.50 for all 3 days…. Any proposal shall be submitted in writing to the Secretary by 30 June duly proposed by one Member and seconded by another. Any member shall have the right to make not more than one nomination, with the written consent of the candidate, for election as one of the Committee Members. Such nominations must be sent in writing so as to reach the Secretary by 30 June. The Committee shall also have the right to make nominations for the election of Committee Members without restriction on the number of nominations. Football on TV at the Club tonight. Contact: Don, Joe or Terry for tickets. 28th May: Harlequins THEN… and NOW! Photo can’t be found at the moment during the rewrite. It wasn’t possible to get the photo from the same place as the previous photo as the railway embankment has gone – replaced by flats and there are huge trees in the way if I were to break into one of the flats to take nothing more than a photo. Pitch looks good though! 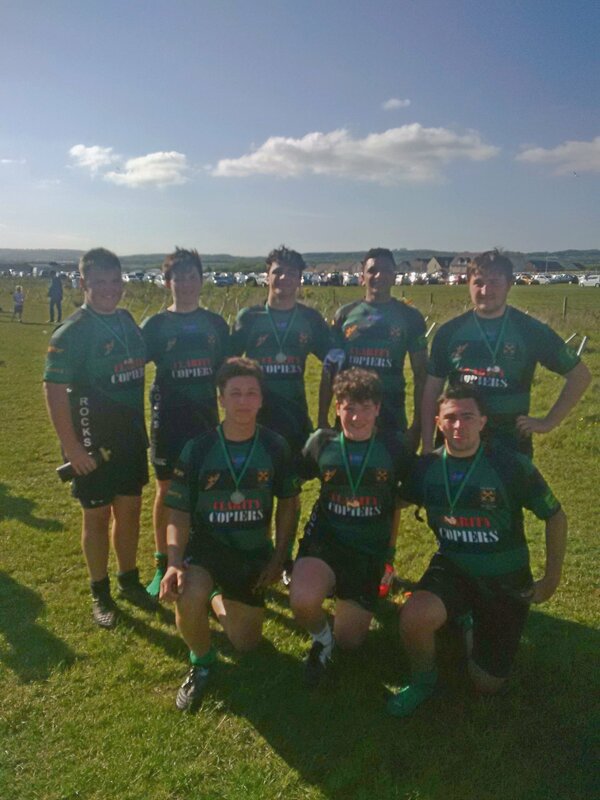 24th May: St Peters Youth finished off another very successful season by narrowly losing in the finals of Jonathan Davies Cup and Jonathan Davies‎ Bowl. Travelling out west is never easy and so it proved with both teams turning up only 10 minutes before they were due to play their first match! So no warm up and it showed for the seconds, who went down in the first game 30-10. The first team managed to shake the cobwebs out quicker and won the first match 25-10. Both teams were superb and with a great attitude they both went though to their respective finals. The day will not only be remembered for reaching the finals but for 2 other games as well. The first team was 15-5 ‎down and were going out of the cup! 4 minutes later they won 15-20 beating their arch rivals Glamorgan Wanderers! Not wanting to be upstaged , the second team went 15-0 down and cameback to‎ win 15-20, Two remarkable games! These results were a true reflection of another great season with two great teams! It has been another fantastic season lads and it’s been a pleasure to be your Team Manager‎. Good Luck to the boys going to senior rugby and the rest of the youth for 2015/2016 season. Chand. 17th May: Good effort from the Rocks Sevens team yesterday in Penarth coached by ‘out of retirement for the day’ Paul Ring and top fizzio Pedro. Played voyagers who beat us comfortably. They were basically Bridgend. Went on to plate where we won next game and beat old pens in a hell of a game where Lincoln scored and converted 2 tries in last 2 mins to win it. Played UIWC (I mean St joes) in final where we thought we drew 33 all. The official scorer had it the same but the ref found another try an kick from somewhere. 40 33 to Joes. Hell of a game. Team: Benon Kizza, Phillip Pariyo, Lincoln Plummer, Jack Huntley, Andrew Caulfield, Ed Poynter, Ryan Cole, Ryan Farrah, Jack Beere (c). Emerson and Hugh (Guests from Cardiff Met). 9th May: Well done to the First XV, who picked themselves up after Wednesday’s Cup disappointment to end the season with an away win over Fairwater 19-31. 8th May: So, let’s start with the positive. Congratulations to the Youth this week, who won the Cardiff & District Cup on Cardiff Arms park, beating Cowbridge 15-8. Well done to all the players, coaches and assistance for another superb season. The seniors had a disappointing week missing the final hurdle on all three occasions. Whilst we should still be pleased that we made three finals, it’s all a bit bitter sweet losing to Dinas Powys 21-18, Llanishen 29-17 and Caerau Ely 20-17. Friday night was also Mike Baldwin’s last game for the Rocks. 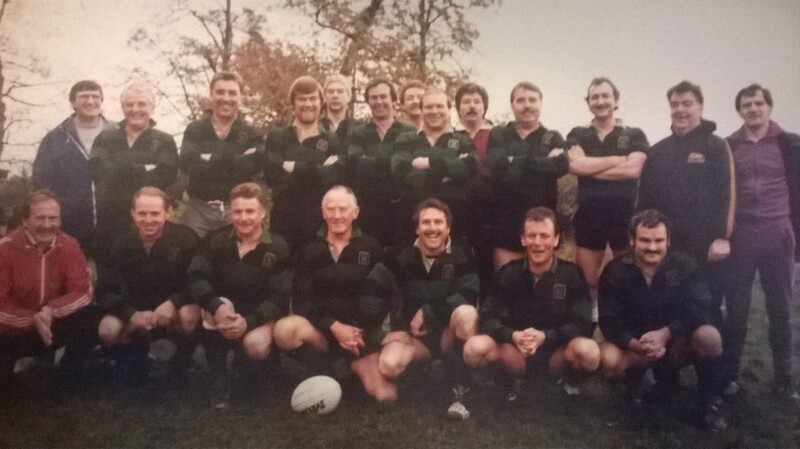 Mike started playing for St. Peter’s RFC over 40 years ago and has played over three and a half million games for the club at all levels. Mike has been running out for the Vet’s longer than most of our first team have been walking. Mike you ARE a Rock. Thank you for your service to rugby at St. Peter’s. You may now officially stand behind the posts on the Harlequins with the other coffin dodgers. 26th April: Bonus point win yesterday for the Rocks with a 51-14 home win to Pentyrch. 22nd April: In the latest round of Rock – Paper – Squirrel, Rock beats Squirrel once again. Well done the the Thirds this evening, who progressed to the final of the Ninian Stuart 31-5. 21st April: Rocks II 27-21 Rhiwbina II. Great result for the Two Gang this evening against a determined Rhiwbina outfit. The Rocks led for most of the game with Rhiwbina pulling in front, with a penalty, in the last minute and talk of post finals-night drinks being arranged by their supporters were heard. The second half was dominated by the impressive forward display from the Rocks who forced the opposition scrum to admit defeat and go passive. This strategy certainly worked as the Rocks were down a point or two (can’t remember) with moments to go when Phillipe joined the festivities to round off a great night for St. Peter’s leaving the Squirrels going nuts and a very quiet Danny Murph. Well done to all involved tonight taking the Two Gang to a Final alongside the Firsts. Mike Thomas reports that the last time we reached a Mallet Cup final was 1928. He missed the game injured. Tomorrow night it’s the turn of the Cavalier Thirds who once again face Rhiwbina in the Ninian Stuart (6.15pm) on Tremorfa Park. 20th April: Remaining First Team fixtures – Pentyrch at home this Saturday and Fairwater away (to be arranged) and of course the East District Cup Final at Glamorgan Wands v Dinas Powis on Wednesday 6th May at 7pm. Mallett Cup – Semi finals Tuesday 21st April KO 18.15 at Rumney RFC. Semi Final draw – matches to be played on Wednesday 22nd April 2015. The seconds game was cancelled…………again! They must of heard about the Taffs Well score! The Vets played a touring side from Bristol and let them come within 5 to be hospitable! What do you call 2 under 15’s , 5 under 17’s , 6 under 16’s and 2 Irish? The Rocks Youth Barbarians! Again, being hosts they let the Irish boys come back to within 10! The really drama was at Pentyrch! The firsts were cruising and I mean cruising to a bonus point win , they led 22-0 at halftime! 15 minutes later is was 22-15 what the &%£$ ! They did however hold on and ran in a further try to win 29-15, Phew! A big another big week ahead! East District Semi and the Youth 2nds going for promotion! Just remember its Fast and Furious in the ready money round! What a disaster last night! The thirds played Llanishen away and they let them score a try! Its a treble of semi finals for the “The Big Rocks” and to say the thirds played well is an understatement! Tries from Phil W, Rob P, Owen D, Matt K sealed an emphatic win. It was 60-5 or 63-5 or 65- 5 (Mikey was scoring again)! The best try of the night has to go to Donkey, He burst over the line from 5 yards, shoulder barging the ref out of the way for the vital score! Mullane was immaculate with the boot in the first half, but got fed up and kept trying to go under posts in the second half. So there’s no pressure for the 1st’s or is there? Assassin for Chairman…………………..You heard it here first! The Summer is here and so is the semi-final of the Mallet Cup. St Peters 2nd’s show a master class of rugby last night, running in 6 unanswered tries! Even though the 2nds were full of youth players, it took an old head to score the first try! Ollie Shepherd crossed after 10 minutes. This signalled a try fest ? Well no, Why? Because everybody wanted score! We had Aviet deciding he’s not a forward but a centre and Colley must have been captain because the new rule was you can only pass to me! Which meant we only led 7- nil at halftime! The second half was a different story. St Peters sorted themselves out and ran in a further 5 tries from Corfield 2, Chandler 1 , Ballie 1 and a penalty try! Johnny Morris (looking better than he did on Animal Magic) kicked 5 out of 6! The final result was a resounding 43-nil (even though Mikey Thomas thinks its 49). Well Done! Now for the thirds tonight, a tough ask but they are tough lads! The seconds play Taffs Well at Home in the Mallet cup on Tuesday 7th April KO 6pm so meet at 5pm. The thirds play Llanishen away in the Ninan Stuart cup on Wednesday 8th April again KO 6pm. Lets get 2 from 2! Ask not what your club can do for you but what you can do for your club! 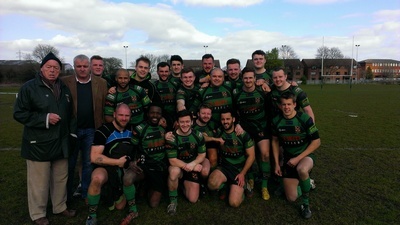 4th April: Good wins for the First and Second XV. First XV narrowly beat Penarth 23-20 and the Seconds beat Llantwit Fardre 43-31. The First XV faced a resurgent Penarth who, having won their last four games, came to play some rugby. Whilst the game was certainly not pretty, the final score was hard fought for in the dying moments of the game. The Rocks were 9-20 down with ten minutes to go and scored two converted tries to take the spoils. Mallett – Seconds XV v Taffs Well II XV on the Harlequins. Tuesday 7th April 6pm. Ninian Stuart – Third XV v Llanishen III XV at Llanishen (Usk Rd). Wednesday 8th April 6pm. First XV: Worthington East District Semi-Finals: Games take place at Llandaff North RFC on Tuesday 14th April ko 6.15 with the final at Glamorgan Wanderers on Wednesday 6th May ko 7pm. 3rd April: Rugby this weekend: First XV – Penarth at home; Second XV – St. Joseph’s away. 1st April: Congratulations to the following players on being selected for the Cardiff and District match v Penarth on Good Friday. Ellis Young, Ryan Newton, Sam Newton, Jake Donovan, Nick Davies, Jack Allwood, Ryan Farrah, Alex Lloyd. Good Luck on Friday!!! 28th March: Good result for the First XV, beating Pontyclun away 6-17. Both Youth teams fought hard today playing some superb rugby, but narrowly missing out on the win. Youth XV lost to Pontypridd on the Harlequins 18-19 and the Development XV went down 34-24. Still loads of games to go for the youth. Seconds are still up for promotion and the firsts are in the district semi finals. Both teams narrowly missed out on the East District semis! 24th March: Rugby this coming weekend: First XV away to Pontyclun. Seconds XV home to Glamorgan Wanderers II. Youth at home to Pontypridd. Hopefully, things have settled down with the site. Some photos are still not working, but it’s being looked at. 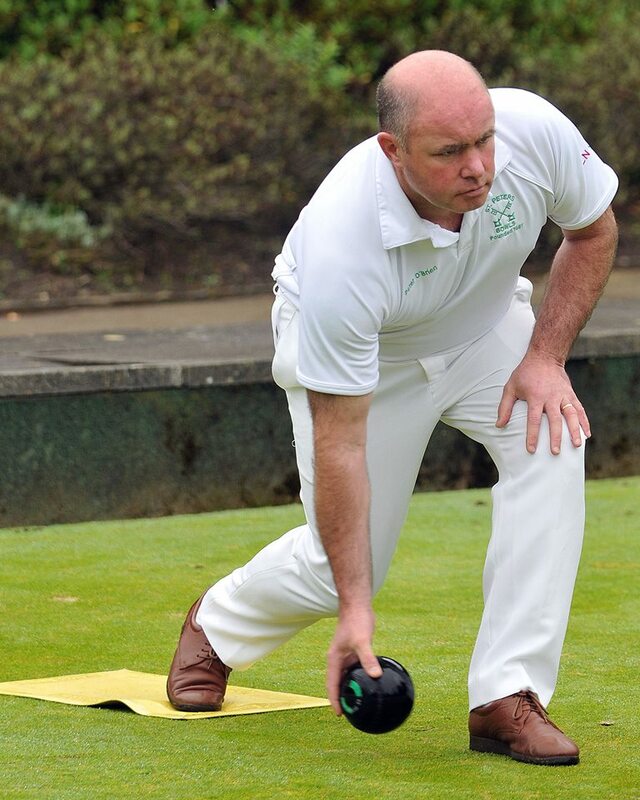 6th March: Date for your diary: Vets game 11th April (12 noon) against Old Bristolians. 5th March: Rugby this weekend. The First XV host St. Joseph’s RFC on the Harlequins, Two Gang will play Rumney II also at home. The youth are taking two teams to Pentyrch. 25th February: The Wales Under 20 starting line-up to face France includes five changes from the side that narrowly lost to Scotland a fortnight ago. At last our very own Jordan Viggers is in the starting line-up. Jordan starts at Full Back. Coach co-ordinator Allan Lewis said, “While there are a few players out injured this week, the situation gives others an opportunity to play at this level and the changes certainly don’t weaken the team. France U20 v Wales U20 Saturday 28 February, 8.55pm local time, 7.55pm on S4C. Best wishes Jordan from everyone at the Rocks. 24th February: C’est ce temps de l’année… The time is here… For all the travelling Rocks. Meet at the Rugby Club at 7.15AM to leave at 7.30AM. Bring your passport and boots. The only other information needed is – we’ll be back on Sunday about 7PM. 23rd February: Rugby this coming weekend – the First XV travel across the city to play Fairwater, the youth have the Wanderers at home and Llanrumney away. 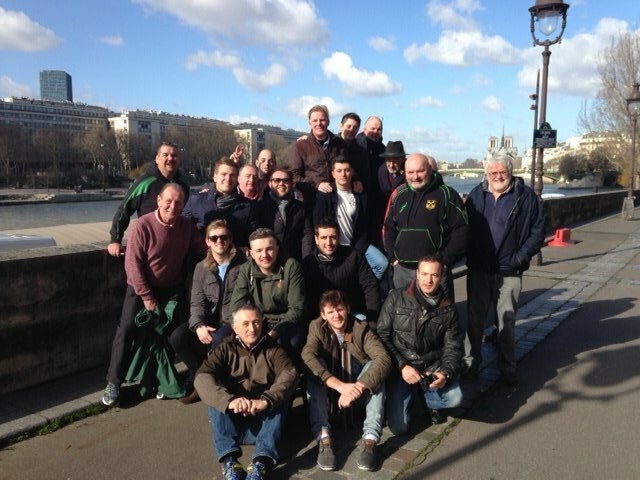 Meanwhile the Rocks travelling Social Team will be playing Frank’s select XV in Paris on Friday afternoon. 19th February: It’s more celebration this week. Firstly we acknowledged Jordan Viggers on his Under 20’s cap followed by the youth league positions. Not to be outdone – Patsy’s Under 16’s are celebrating with congratulations to Ben Thomas, Sion O’Brien, Marley Lovell, Tom Meehan, Josh McAuly and Joe Miles, who have all been selected for the Wales under 16s squad. Good luck to all from the club especially from the proud coaches Patsy and Don. The future is bright – the future is Green and Black!!! 17th February: It’s back to Rocks Rugby this weekend. The First XV entertain Brecon at home in the League and the Youth play Aberdare also at home. Club Social to follow the game. 8th January: Benon and Pariya make headline news for the Rocks – Read all About it. For a full copy, buy the Wales on Sunday today. Any questions and or comments from the media or press to members or the committee should be directed to Joe Sweeney – Chairman on 07812136468. 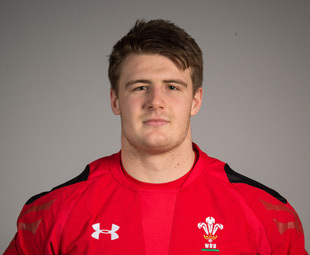 8th January: Great to see JORDAN VIGGERS get capped for Wales U20 this weekend. He came on for 13 minutes late in the second half and caused chaos for England, being pivotal in two crucial turn overs and … the biggest hoof of a ball off the field at gone 80 minutes ever seen. Well done Jordan. Great win against England. ROCK ON. 7th January: Another good, but narrow, win for the First XV 23-25 on the road to Porth Quinns. The next league game is on 21st February at home to Brecon. Meanwhile the seconds notched up 43 points at home to Clwb Rugbi II winning 43-5. Well done to both teams today. 6th January: First XV tomorrow are away to Porth and a prayer for the boys in red tonight…Dear God – remember – Bethlehem is in Wales!!! Amen. 31st January: The First XV gave us another second half scare today at Llandaff Fields against CRCC where they led 19-3 at half time. A poor start to the second half by the Rocks allowed hard-running CRCC back into the game scoring brace of tries early on. A resurgent forward dominated ten minutes from the Rocks prevailed, before the ball was shipped wide in the final quarter to put Pareyo in for his second of the match. The score remained 20-27 for the last fifteen minutes of the game, before a similar try was scored by CRCC. As the clock ran down to the last minute, The CRCC stepped up to level the scores from 10m wide of the sticks. To the disbelief of – just about everyone – the ball was pushed wide. A narrow escape or a superb start and determined defence? Who knows? The scoreboard showed 25-27… Result!! Next weekend, Wales v England Friday night in the club, but the big game is Porth v Rocks on Saturday. The Youth had a good win travelling to Rumney 3-19 and, although the seconds pushed Rhiwbina hard for 70 minutes, the result went against us 42-28. 28th January: Rugby this weekend. First XV away to CRCC on Llandaff Fields. Second XV away to Rhiwbina II. Thirds at home to Old Illtydians II. Youth away to Rumney and the Development – Barry at Home. 27th January: Social Fixtures for your Diary. 25th January: The First XV played a game of very different halves on the Harlequins yesterday – leading 24-0 at the break, but needing to defend a determined Abercynon for much of the second half. The final score of 34-26 was well deserved for both teams, who each left the field with a bonus point. The seconds man of the match – The Mercurial Mullane – successfully converted all seven of the Rocks tries who finished the afternoon with a 42-14 victory over Cardiff Harlequins II. Meanwhile, the Youth travelled to Aberdare where a last minute score for the home team meant a narrow defeat of 19-17. Monies for the above trip should be paid to Baldy as soon as possible. The trip has been paid for and now the monies need to be sent to Baldy as soon as possible. You know how much you owe – let’s get it done. We also need to send to Mike quickly – name, DoB and passport numbers (ideally a photocopy or scan of your passport would be ideal). Allez!! 21st January: Best wishes to Dennis Norman, who is currently unwell in hospital. 21st January: Congratulations to six of St. Peter’s Under 16 Squad, who have been selected to play for Cardiff Blues Under-16s South will tackle Scarlets East Under-16s in the WRU Regional Age Grade at BT Sport Cardiff Arms Park this evening. Well done Tom Meehan, Sion O’Brien, Marley Lovell, Joe Miles Ben Thomas and Josh McAuly. 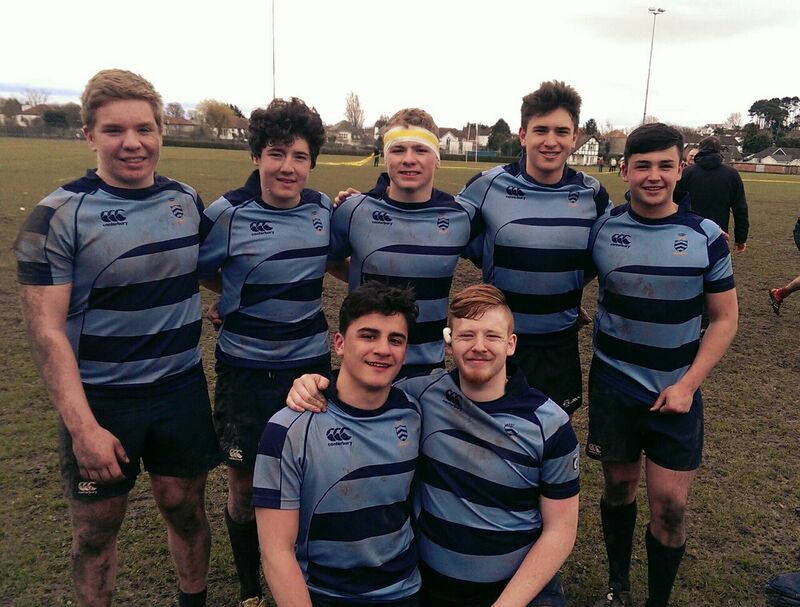 More from the Under 16’s… Dafydd Manley,Sam Wall and Dylan Lawley who played for the blues development against the Dragons on Monday and Ioan Davies, Gruff Roberts and Josh Nolan, who play a year up in the u16s, are rd Ain the Cardiff schools First Squad for this season. The future is good. The future is green and black! 18th January: First team lost to Wattstown 7-24, Thirds lost to Barry, 19-0. 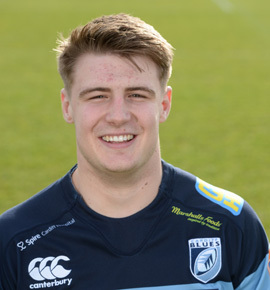 17th January: Congratulations to Callum Sheedy (Bristol RFC) and Jordan Viggers (Blues) who have been selected for the Wales Under 20s squad. Both players are products of the Rocks Junior Programme. More. 11th January: At last some rugby news to report for the first time in nearly a month! A great start to the new year for the Rocks yesterday with three wins out of three. Firsts won 25-3 at Gwernyfed, no bonus point but 3 tries. Seconds beat Llanishen 35-32. Junior youth beat Cardiff Quins youth by a lot. Happy New Year!!! Next week, the First XV travel to Wattstown. 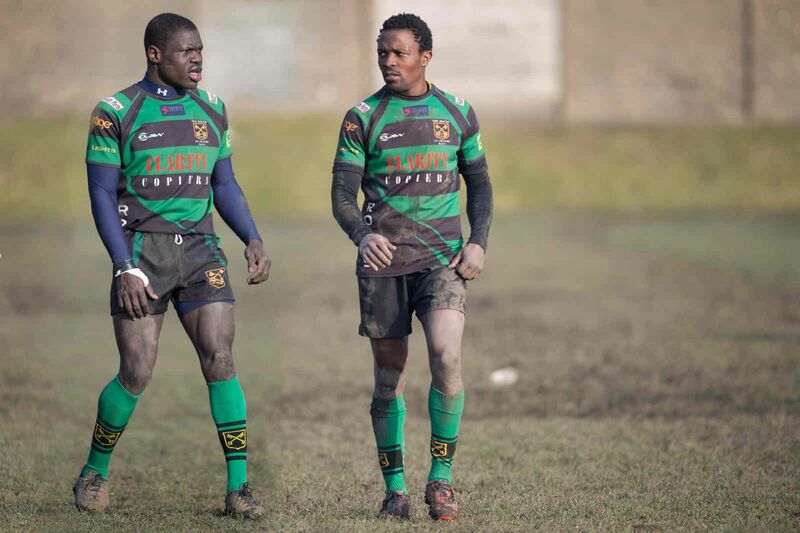 6th January 2014: Rugby this coming weekend. First XV Away to Gwernyfed, Seconds Away to Llanishen IIs, Third XV Away to Fairwater IIs.